Is there a more iconic picture than a polar bear stranded on a piece of ice to illustrate climate change? As everybody surely knows, the artic sea ice is melting away. Recent studies show that an ice-free summer in the Arctic could be reality as soon as 2040, destroying the ecosystem that allows polar bears to live. But the survival of these majestic creatures is also linked to our own. The decrease of sea ice extent in the Arctic ocean influences the whole Earth climate. Scientists all around the world make climate predictions for policy makers in order to make decisions on greenhouse gas emissions and other climate related regulations. To improve these predictions, our sea ice models are constantly tested against observations of ice. However, observing ice is not that easy. Sea ice is messy and formidably extensive despite the recent anthropogenic decreases. 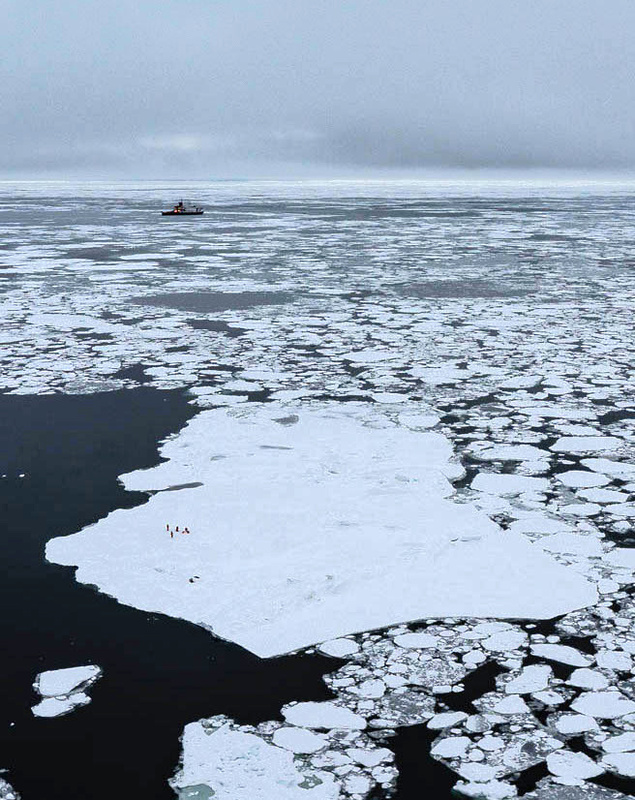 Crossing the Arctic ocean with the Polarstern makes you realise how diverse the ice conditions can be. In the matter of minutes, the ship goes through thin and small ice pieces to 2 m thick ice, ice ridges with incredible shapes, and ice so thin that it deforms without breaking with the waves like a silk veil. The area covered by ice is huge, we cannot directly measure it all, and certainly not at the same time. These difficulties are why we use satellite observations. Satellites are handy. They are fast, cover a huge area, work for several years in a row, and cannot get broken by bad weather. Unfortunately, they have a large uncertainty when getting ice thickness. To be fair, this is a difficult problem to say the least. How to differentiate from 800 km altitude, between ice, ice cover by snow, water on top of ice, open water, thick and thin ice. And all these informations are mixed in one grid cell their captor. And this brings us (finally) what I wanted to tell you. 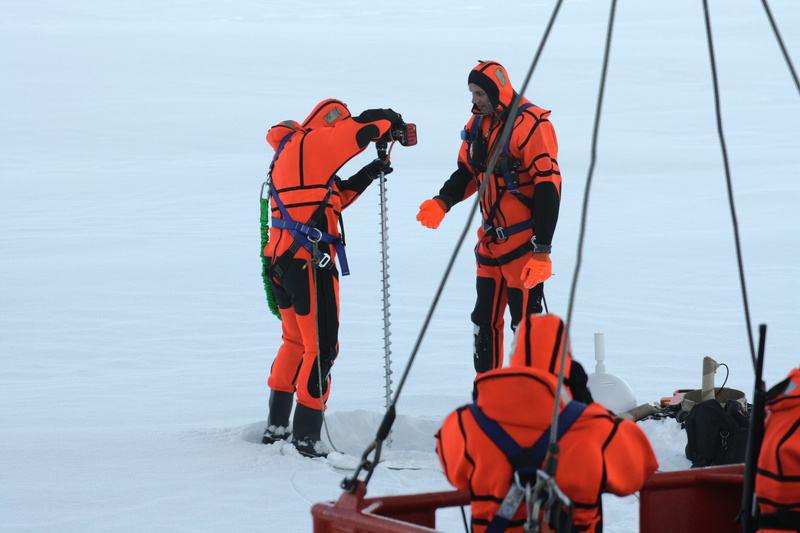 – The most precise way to measure ice thickness is actually to go on the ice, drill a hole, and measure the thickness of the ice you are standing on with a stick and a rope. – The most precise way to measure snow thickness, is actually to poke a graduated stick in it and measure how deep it is. We repeat the measurement several time because ice and snow can be thicker on one side than on the other, but this is basically it. But each time a measurement is made, we have only data for one specific point, at one specific time. This is not a lot of samples to compare to model simulating several years over the entirety of the Arctic. The other problem is that such a measurement imply several things: an icebreaker, maybe a helicopter, a polar bear guard, and a handful of really warm clothes. The whole package being quite costly. Nevertheless, these measurements are useful and rare. The current cruise gave us the opportunity to make some measurements, and those will be the only ones is the Arctic region we visited for this year. This give you the idea how scarce would be the measurements without satellites. There are other ways to measure ice thickness; these require more technology, and measure more extent, but at the cost of less precision. We already discussed satellites above, there are also electro-magnetic devices that are put onto a sled and allows to get a profile of the studied piece of ice. A similar device, called an EM-bird is used from planes to get extended profiles of ice thickness. 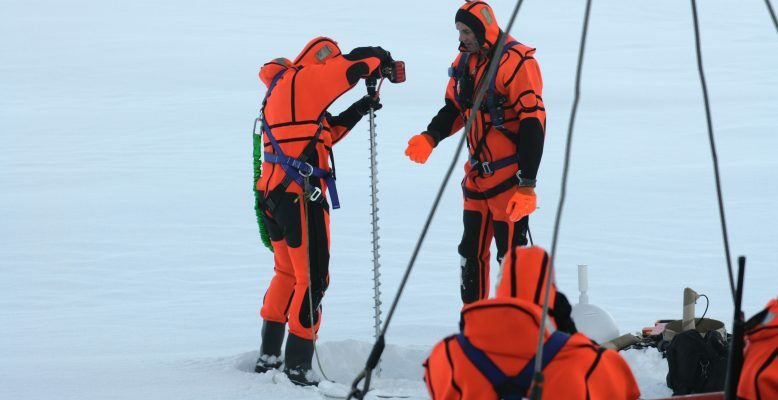 If one has a submarine, an upward looking sonar can get you precise profiles of ice thickness over great distances (but honestly, who has a submarine in their basement…). We definitely need satellites to get an arctic-wide cover of ice and snow thickness, but if a stick is not the fanciest instrument, it gives you a reliable result that you can compare to the other measurements, to improve them and to calibrate them. So next time you have the luck go skiing and put your stick in the snow during a nice curve, think of this great measuring device in your hand. Hey Damien, your article is very interesting. I think it’s terrible what the people do with the world. 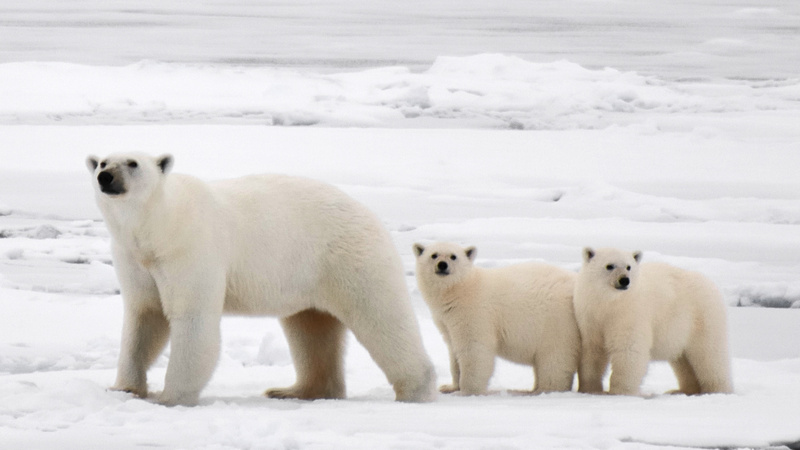 The climate change isn’t good for the polar bears and all the animals in the world. How impressive, that the ice thickness can be that various.